The following kit review was very kindly sent in by Woodlore customer Julian who, we’d like to point out, is not affiliated with Woodlore in any way – he’s just a very happy customer! Yesterday I just used the Honey Stove, and I must say what an amazing piece of kit it is. The crusader cup and stand don’t even compare. It’s surprisingly easy to setup and compared to other equipment I’ve owned and used it’s lightweight. The different setup configurations are really handy which make for a very versatile piece of kit. Once set up, it is a very strong structure. The best thing about it is its flat-pack structure; this makes it ideal for expeditions as it does not take up much space at all. Considering the distances I had to travel and weight limitations put in place on previous expeditions, I say: I wish I had bought it before. Works extremely well with both wood and fuel tabs. For me this is the best kit in its category I ever bought. I would recommend it to any one. It’s a MUST HAVE! So far I’m satisfied with all the items I bought from RayMears.com. The best website I came across so far. As I’m doing, I would recommend the website and products to anyone looking to buy this sort of equipment. The quality of the products and knowledge available is the best I ever came across. This entry was posted in Bushcraft Clothing & Equipment, Customer Posts on September 27, 2011 by Woodlore Team. The Honey stove ticks all the boxes for me. The ability to burn natural fuel for that “camp fire” feeling, the ability to use a Trangia burner and of course with the addition of a Kiwi boot polish lid (fits nicely in the Honey Stoves circular cut out)the ability to use hexi and greenheat. From my own tests I have found the following best. If using a Trangia burner position it in the middle slot, using the boot polish lid and hexi use the middle slot. For greenheat use the boot polish lid in the top slot. Like most things in life you need to practise assembling the stove to become competent. John’s posting reminds me of a couple of things that need to be considered when using the Honey stove. In order for combustion to proceed effectively, it is vital (as in all fires) to provide air within a band of flow rates. For the Honey stove, this is done via free convection. In stoves with an electric fan, it is done primarily by forced convection. For free convection, the resistance to air flow through the bottom of the stove needs to be low otherwise the charge will burn poorly, if at all. So it is very important to ensure that the gaps at the bottom of the stove are not fouled by leaves or forest litter. If the earth is of high mineral content then the problems of free flow and scorching can be solved simultaneously simply by clearing away the forest litter, just as is normal practice for an open fire. However I find that the addition of a small boulder (not spherical, and preferably parallelepiped) beneath the stove helps considerably. If the soil has a high peat content then great care is required. One possible solution could be to run the stove on top of a metal pot. Incidentally there are wood gas stoves that work well with no fans, just using free convection. John’s suggestion of using a cross cut log is well taken. It would probably need a high tar content to ignite, so something like pine seems appropriate. I recall that one of Ray’s programmes showed that method in use. In that case the free convection would be improved since the combustion zone is well removed from the ground plane. The Honey Stove does not manage to be as efficient as a true wood gas burning stove. However it is vastly more efficient than an open fire. Because of its slotted design and its ability to pack flat it is rugged, dependable, and requires very little rucksack space. I use mine for those occasions when I want to cook quickly and do not need space heating. When dry twigs are not easily found I split down a seasoned round of wood (about wrist diameter and height) using a knife and a baton to strike its back. The resultant pieces burn well even in rather wet conditions. I find that two or three such rounds are sufficient for the purposes of cooking breakfast. I’ve just returned from 10 days out on the land in N. Ontario (so beautiful! but, I am biased ;-)) I just got the Bushbuddy Ultra – and, I love it! It only weighs a few ounces and is very easy to use. I gave the meth burner (instructions from previous blog) a try. Amazing! Not only a fun project – but, it certainly does work! Thanks for the review Julian, I have the Honey Stove myself, but as yet I’m still not altogether convinced. For wood burning, I use a Bushbuddy from Canada, which is much more efficient and for other fuels, well there are other options. The Bushbuddy fits inside my pot and also has a pan stand which I can use over an alcohol stove. The alcohol stove and a brew kit fits inside the Bushbuddy. 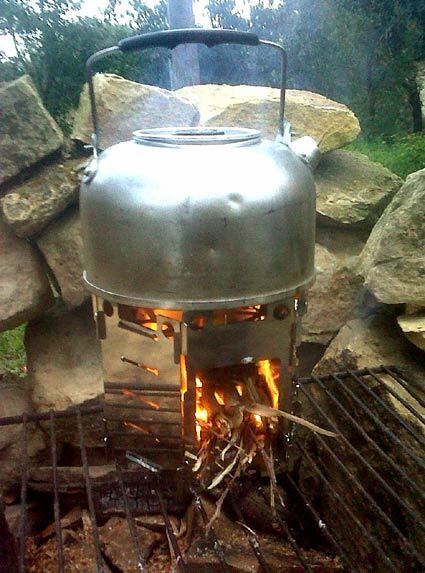 I so want to like the Honey Stove, because of it’s versatility, but the Bushbuddy is the better, more efficient option for me. Weighs less too.